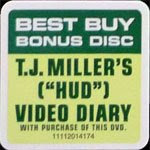 The Best Buy version of the Cloverfield DVD included a 30 minute "TJ Miller's ("HUD") Video Diary", featuring behind-the-scenes video of TJ Miller doing what he does best, goofing around on the set of Cloverfield. If you haven't already purchased the limited-edition version, it is probably too late, but you can still watch the videos here. * Thanks to Gabriel for emailing me about this! Just got my DVD and goodies in the mail, and just thought I would say thank you to Dennis!!! i love him. i dont know, it just so simple but i dont know.. i find him really funny. And their already down...why don't people put stuff like this on google video where it will actually stay up? Sweet I totally found the vids. So, do you guys think it's IG also ?